Woke to Thai and Laotian roosters duelling across the Mekong; a croaking crow-fest that fell away in sputters like a slapstick comedy routine. Pim was nowhere to be seen yesterday – she had been in Leoi. She was downstairs now and chatty. She pointed at my bamboo thongs, saying, “I like”. They were very comfortable. I had bought them at Khon Kaen Walking Street Market. “I know of it,” she said matter-of-factly. Had breakfast at a place on the cnr Soi 9 and the main road. It was run by a friendly Thai family with no English except for ‘soup’. So, that’s what I had. It was good too – kale with fresh chicken and assorted flavours that differentiated it from others. I paid, said goodbye. Pim replied likewise and returned to her conversation with the woman. 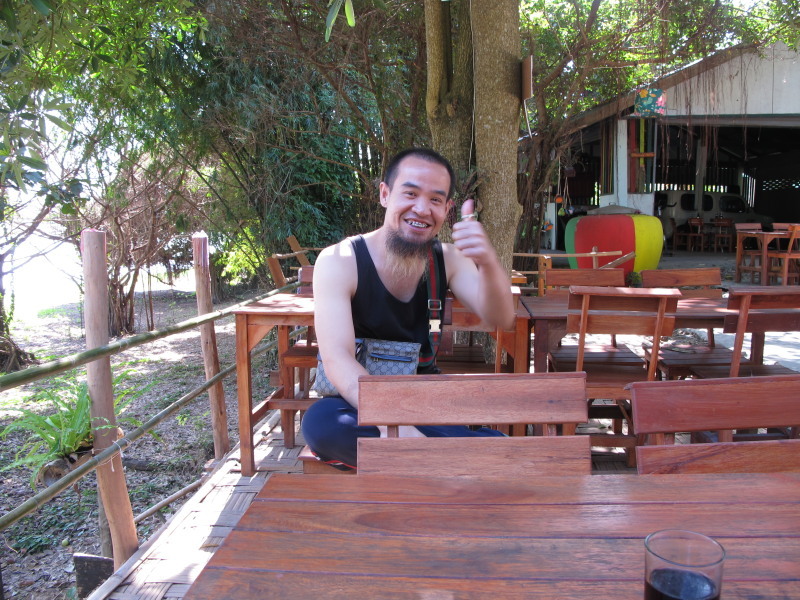 A Chinese Thai from Chiang Mai, also staying there, wished me, “chok dee” (good luck). 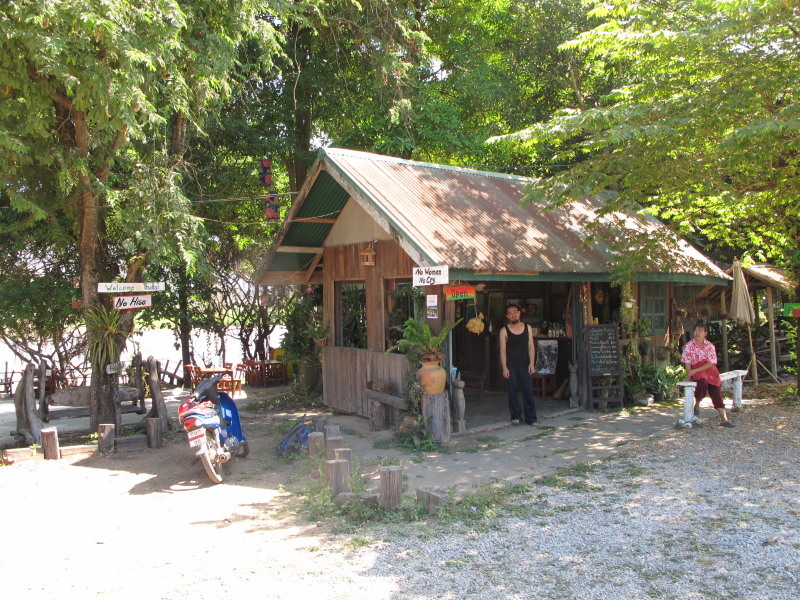 I aimed for coffee on the way out of town at the roadside cafe of yesterday, but in keeping with Chiang Khan’s unpredictable opening hours it was closed. I had decided against taking the inland loop to Pak Chom or Nong Khai. I had already found a patch of paradise at Sangkhom, and preferred to return there rather than search for something else that might not exist or, if it did, wouldn’t be found. So retrace tarmac I did …even if the tarmac was somewhat patchy along the first stretch of road. 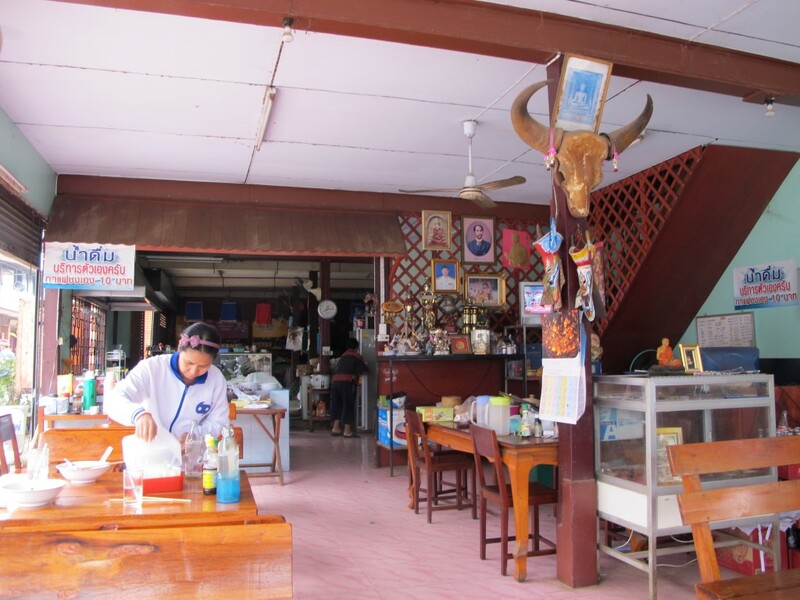 Just before Pak Chom I dropped into a cafe/restaurant called ‘Thai Tai’. I had noticed it driving by on Day 3 – it had an alternative, quirky, hippy look. It is run by a Rastafarian Thai, I learned, and his older brother, Tou. Though, I gained an impression the former was more reggae fan than Rasta. With only Nescafe or Thai coffee on offer I settled for a coke. Tou sat with me. He wore braces on his teeth and had a long goatee beard, the bottom half of which was died blonde. The Rasta Thai had said their father was in Khon Kaen where they came from, but Tou now said only the mother was there and that their father lived elsewhere, so I concluded the two were separated – as common a theme in Thailand as anywhere in the world, perhaps more so. They served meals and there is the option of pitching a tent if you had one. I doubt they did a roaring trade. Maybe locals dropped in at night. I continued on to the other side of Pak Chom to Pookie for a revisit and a much needed Americano. Mac was there, this time in police garb and sitting with two uniformed colleagues. I felt he was torn about who he should sit with, but he joined me. He referred to his colleagues as ‘my friends’, but they might not have been of equal rank. I wondered, to myself, if they would expect freebies at the cafe. 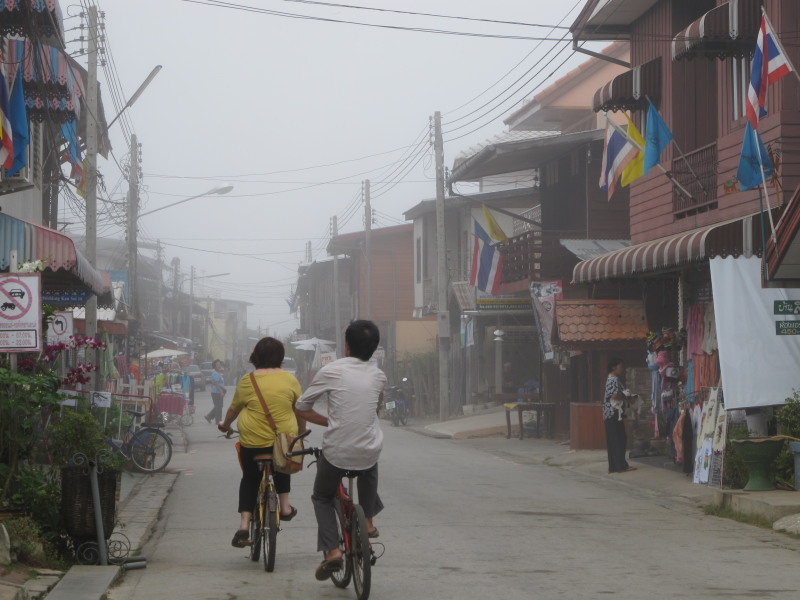 Surprisingly, another foreigner arrived on a motorbike and, seeing me, wanted to chat. That freed Mac of any obligation, so he rejoined his fellow cops. The foreigner was Mark, a chubby, baby-faced Finn. He had a Thai girlfriend in Pak Chom he intended to marry. He was investing in a rubber farm with her family. Apparently it took about ten years for rubber trees to mature, and until then “only took your money, but was good after”. He met his girlfriend through another Thai girl he was in love with, but she wanted to end, or postpone their relationship indefinitely. “She had a kid and was really beautiful, but had problems”. He finally put it on her to help him find a replacement – he wanted a good girl, not a bargirl (she might’ve been one of the latter). She was reluctant to assist at first, but eventually sent him an email of girls that were interested if he wanted to meet them. Apparently, he kept giving the former girlfriend money that she’d send home to her family only for the father to spend it on alcohol or gambling, but the second girl’s family were hard working and wanted to achieve, so he felt better about helping them. Mac’s brother-in-law, who ran the cafe, joined us. Mark had been to Pookie before and knew him. He spoke English and had worked for a chemical company in South Korea, where he claimed one person had to do the work of three, or words to that effect. He gesticulated at all the running around you had to do to complete various tasks. 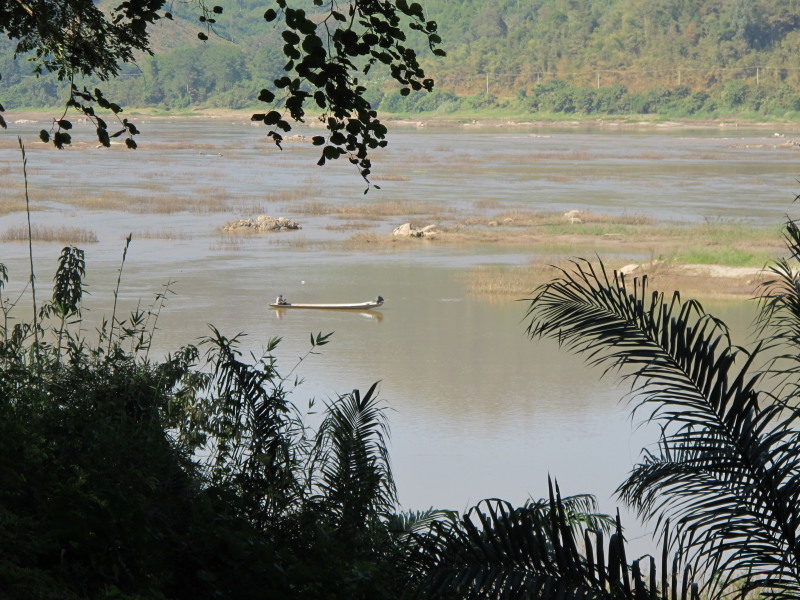 But it had allowed him to set up here, where land was comparatively expensive, presumably because it’s beside the Mekong. Using a conversion rate of 30B per $ it worked out at about $33,000 per rai (1rai = 40 x 40 metres). By the time I finished these interludes it had taken two hours to get from one side of Pak Chom to the other, but I still arrived in Sangkhom around noon. 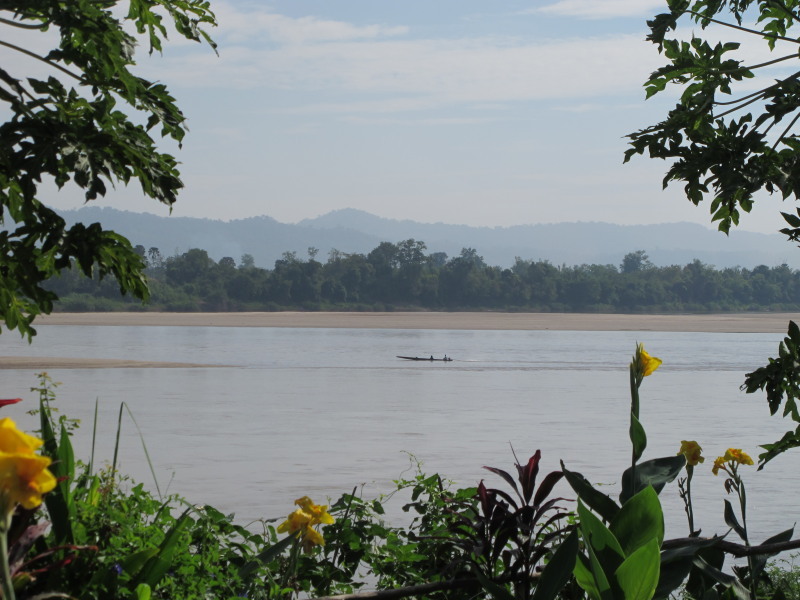 Another sublime ride from Pak Chom onwards, along the meandering Mekong. Dtoy was on the main road, at the end of the lane that led to her guesthouse. She waved and gestured that I go ahead and pick a bungalow. There were three available, but I chose #6, the same as last time. It wasn’t the biggest or necessarily best, but I preferred its setting at the end of the row with the small farm on the other side and the river in front. The farm is an L shaped plot of land, growing various fruit and vegetables, that loops around to face the veranda. Papaya trees framed the water view. Showered, laid back on the veranda, did some writing then wandered down to Tantawan for another Americano, and WiFi. Though couldn’t get the latter to communicate with my laptop – Windows said ‘can’t find adapter’ and required the internet to search for a solution that probably wouldn’t be found anyway. Persistence is futile. A waiter whose gender I had previously been uncertain of, without irony, began teasing another waiter for being similarly undetermined. It seemed that there were far more examples of this gender grey area in Thailand, and Laos for that matter, and it had me surmising if it was due to a national, genetic anomaly (Thais and Laotians share common characteristics). On the other hand, perhaps it is no different here to anywhere else in the world, and they make similar observations about Westerners. They, after all, think we look like monkeys. Coincidently, it was again market day, but not as loudly this time and the music more in keeping with the village ambience. Bought another Kiwi shake (25B), but from a different stall. Took it back to Bouy and downed it with spicy vegetable and ginger with tofu (60B) – a big serving and delicious. A Dutchman, Kettel, had moved into the next bungalow and we chatted for awhile. He had six months in S. E. Asia, and I gave him some travel tips. I consumed a big Chang on the veranda overlooking the Mekong. A light slowly traversed back and forth above the hills in Laos, but no motor could be heard. I was curious as to what it could be. Then it disappeared. Aliens, border patrol, body snatchers? My right ear was biologically invaded on my fist night here – by a bug. That required surgical removal. I thought the odds of a repeat were fairly low – as were the chances of interstellar machines. I felt like another beer, but not a whole bottle, and Dtoy didn’t have anything smaller, so left it at that mellow state of insobriety. In any case, Kettel was now reading outside with his veranda light on, and its brightness obscured the night view, bringing me back to Earth. So I napped on the bench for awhile before retiring to bed. Even paradise has to be shared.